Doctors at Dubai Hospital recently conducted a highly complicated open-heart-surgery on a 29-year-old patient who was admitted with a heart condition that is very rare for such young patients. The patient was suffering from an impaired cardiac function associated to a giant dilated left ventricle aneurysm generated during recurrent heart attacks. Dr Faouzi Safadi, consultant in Cardiothoracic Surgery Department, led the cardiothoracic team that included Dr Tarek Abdel Aziz, Consultant in Cardiothoracic Surgery; Dr Yehya Karaly, acting consultant in Cardiac Anesthesia and Dr Mouhannad Al Assad, specialist in Cardiothoracic Surgery. “This young patient underwent a critical heart reconstruction surgery to repair and reshape the left ventricle that got damaged during a heart attack. Heart attacks in the left ventricle weaken the tissue wall which can form extensive scar tissue and consequently an aneurysm (a balloon-like bulge of a blood vessel) exposing the patient to serious life-threatening complications like rupture of the aneurysm, embolic stroke and irreversible enlarged rounded heart failure,” said Dr Safadi. 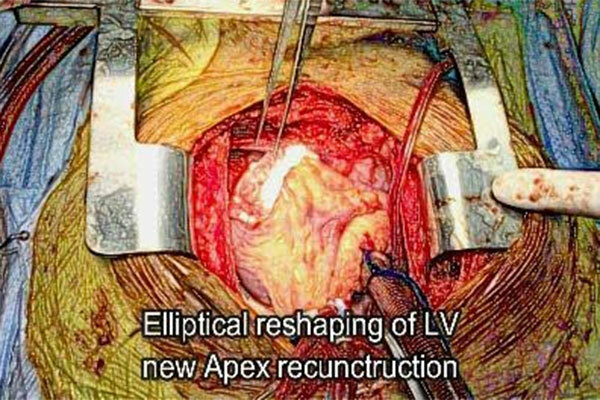 Dr Abdel Aziz added that during the left ventricular reconstruction surgery, the team had to make an incision to remove the damaged areas (thinned and scarred tissue). Dr Yehya added that the team of anaesthesiologists ensured the patient is smoothly taken off the heart-lung machine and to stabilize the patient so that the surgery can be completed in minimal time ensuring patient safety and minimal drug support. The patient was then transferred to the SICU.